Diamond is eminent to own a series of outstanding physical and chemical properties, thus rendering it to be a strong cold cathode material for field electron emission (FEE) applications. FEE from diamond materials comprises the supply of electrons to the conduction band of the materials, transport through bulk, and lastly emission at the surface. 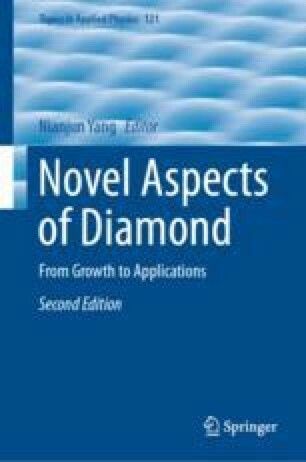 In this chapter, the enhancement in the FEE characteristics of nitrogen incorporated (ultra)nanocrystalline diamond ((U)NCD) films and their related nanostructures is discussed. Ion implantation, in situ impurity doping in plasma, and post plasma treatment processes have been employed to incorporate nitrogen in (U)NCD. The possible mechanism through which the change in microstructure enhances the FEE characteristics of nitrogen incorporated (U)NCD films/nanostructures is discussed. The authors like to thank the financial support of the Research Foundation Flanders (FWO) via Research Grant 12I8416N and Research Project 1519817N, and the Methusalem “NANO” network. K. J. Sankaran is a Postdoctoral Fellow of FWO.